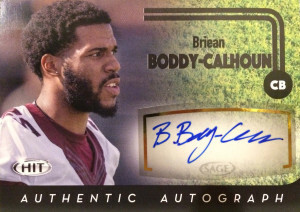 Briean Boddy-Calhoun was a member of a very stout Minnesota Gopher defensive secondary. He and Eric Murray provided one of the most solid CB combos in the nation. BC has a pretty good resume of work with 104 tackles, 3.5 TFL, 15 pass deflections, 10 interceptions for 169 yards and a TD. Scouts liked some of his muscle memory traits with his fluid hips and solid jumping skills. They feel he will most be at home in zone or off coverage, primarily as a slot defender. A few of the draft boards I checked out had Boddy-Calhoun going to the Texans in the 5th or 6th round, but he ended up slipping off the 2016 draft boards all together. He eventually signed a free agent contract with division rival Jacksonville, but was cut before the season. The Browns eventually claimed him off waivers from the Jaguars. In his debut against the Miami Dolphins in Week 3, Briean intercepted his first pass, which he returned 27 yards for a TD. For the record, Calhoun appeared in 14 games, with 7 starts, recorded 43 tackles, a sack, 11 passes defended, and three interceptions in his rookie season. He followed his league debut in 2017 with another 13 games played (7 starts), and recorded 27 tackles, 9 assists, to go along with 6 passes defended.